Mira Stanley has come to Cape San Blas, Florida for one reason: to save Claire Peterson, her boss' aunt, from being swindled and losing her home. She realizes it will be a challenge to defeat Bradley Lane, the unscrupulous land developer, even with her accomplished skills as a lawyer. However, another element adds itself to the equation when Mira meets the attractive Sean Thorndale. The chemistry between them leaves Mira confused and frightened. Sean Thorndale has always been confident and driven with one personal agenda, and it promises to be dangerous. Even if he must deceive others by following Bradley Lane’s orders, he’ll do it to get the justice someone close to him deserves. At least that’s how he feels until he meets Mira Stanley. As their attraction to each other builds, Sean will decide if the dangerous journey to achieve what both he and Mira want is worth the risk. Kathryn Long’s passion is writing mysteries, creating the intricate details and weaving them together into the clues which the reader will enjoy collecting to solve the crime. However, she’s worn many hats over the years – bookseller, teacher, mom, wife, and author. Many of her works include Native American elements and hints of the paranormal. She loves a scary ghost story! Writing took a serious turn several years ago when she had her first book published. 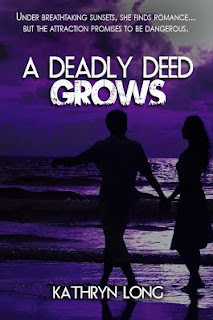 To date readers can find her self-pubbed cozy Lilly M Mysteries, and her traditionally published work: paranormal mystery, Dying to Dream, and latest, a romantic suspense, A Deadly Deed Growsat online retailers and in bookstores. Always striving for better and greater achievements, Kathryn has recently signed with literary agency, Golden Wheat Literary and agent Jessica Schmeidler who is working diligently to sell Long’s latest mystery, Grave Maker Blues. When writing and the creative muse take a break, this author loves to travel, watch Castle, and of course, read mysteries. 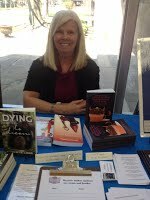 Oh, and there’s always an author event or two she will attend in order to – you got it – talk about mystery. Kathryn lives in a small burg located in northeast Ohio with her husband and little pooch, Max. Most writers will learn as they go, make mistakes and hope to do better the next time. That’s why getting advice from those who are willing to share tips on the craft is so appreciated. Anything to help avoid those pitfalls. Right? There are lots of books on writing, from mechanics to pitching to marketing to whatever you’re looking for. It’s all there. I have a whole library of them myself. Authors networking with authors through social media or in person provides a wealth of knowledge, too. For instance, I belong to the local chapter of Sisters in Crime and I frequent author expos. Writing is such a solitary endeavor. Rubbing shoulders with other authors is like therapy. It’s difficult to narrow down the multitude of things I’ve gathered during my career in writing—almost twenty years of accumulated knowledge—and I’m still learning, but here you go! 1) Your first attempt may not be worth publishing. Okay, that sounds harsh, but it’s reality. Your writing should get better with time. Like any skill, practice can make perfect. In this instant-gratification society we live in where most of us want to see quick results, hearing someone tell you to wait, write another book or story, try again because next time it will be better is not what we like to hear. Nonetheless, it’s prudent advice. 2) Find something to write about that you love. Here’s the catch. You may love it, but perhaps no one else will. It happens. If your goal is to get something published, understand that it’s a business. No publisher is willing to put X amount of dollars into a project that nobody wants to read and thus makes zero profit. Unless you’re writing purely for your own pleasure and never plan to sell, find something to write that you love and readers love. 3) Writing one project takes so much time, so much effort, but may gain so little reward. You can write and suffer through it enough to draw blood. It can take you from months to years to write one book. Nobody out there in the writing/publishing world cares. Readers don’t think when they consider buying your book how much time you spent on it, how many hours you sweated and slaved. They want a great read at a real bargain. Bottom line? If you love writing, you’ll keep doing it no matter what the reward. 4) It only gets harder. Did I say the writing gets better? Yes, I did. Here’s the thing. You improve and you expect more of yourself. Make sense? It’s like earning all A’s in school. Now, everyone including yourself expects A’s in the future, and forever! You can’t help it. The naïve writer you once were, the one who didn’t know you should be cautious of how many times you use words like that, then, would or could, or recognize the difference between showing and telling, that person has been replaced by a wiser and craftier writer. That person won’t be satisfied with mediocre. Yeah, it only gets harder, but your writing gets better! 5) Writing can become an obsession. What do you mean? I can walk away from it at any moment. Yeah, think again. If you’re passionate about it, you’ll have a tough time giving it up. I say this from my experience, but I have heard other authors argue the same. You’ll think, sleep, eat writing, create little scenarios in your head, recognize great story ideas everywhere—the six o’clock news, the man talking on the phone next to you at the bus station, the bickering couple at the table across from you at the restaurant, the stories are everywhere and you can’t stop them from invading your imagination. They beg to be written. Yep. It’s an obsession, but you’ll probably love it. At least I do. Thank you for hosting my book tour and graciously posting my article!